At NAMM 2018, Bitwig announced Bitwig Studio 2.3 with the new powerful phase-mod Synthesizer, expanded device view & more! 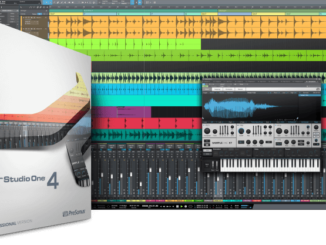 This year’s NAMM Show is just around the corner and Bitwig announced today already a big update for their DAW Bitwig Studio. The new version 2.3 includes a brand new phase modulation Synthesizer (Phase-4), expanded & improved device view, time signatures changes, good improvements to the time-stretching algorithms, a new instrument & selector and much more. 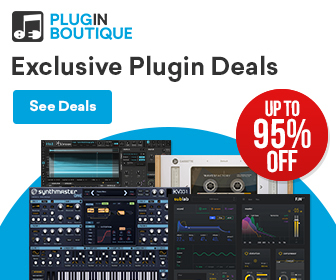 Looking forward to check out this new Synthesizer built-in Bitwig Studio. Stay tuned for my video coverage from NAMM about this big news. Meet Phase-4, a four-oscillator synthesizer powered by phase modulation and phase distortion. Drawing inspiration from legendary digital synths like Yamaha’s DX7 and Casio’s CZ series, Phase-4 is capable of vintage sounds that we know and love, but it goes further, greatly expanding these phase manipulation concepts. At the heart of the stereo oscillators in Phase-4 is a sine wave that can be shaped by five different phase distortion algorithms. 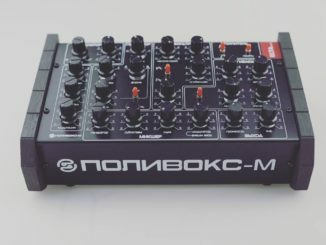 Each oscillator can also be phase-modulated, by itself and by the other three oscillators, producing a vast range of possible sounds and timbres. This combination of phase distortion and phase modulation – which we lovingly call phase manipulation – brings Phase-4 to life with all of its awesome sonic power. The oscillators can even manipulate the built-in filter section for incredibly crisp and edgy textures. It’s time to break some (literal) boundaries and let our devices spread out further into space. Panoramic view and controls are now available for seven of our devices: EQ-5, FM-4, Phase-4, Polysynth, Resonator Bank, Sampler, and Spectrum Analyzer. Also available as a detached floating window, the Expanded Device View enhances the connection, understanding, and control of each device. 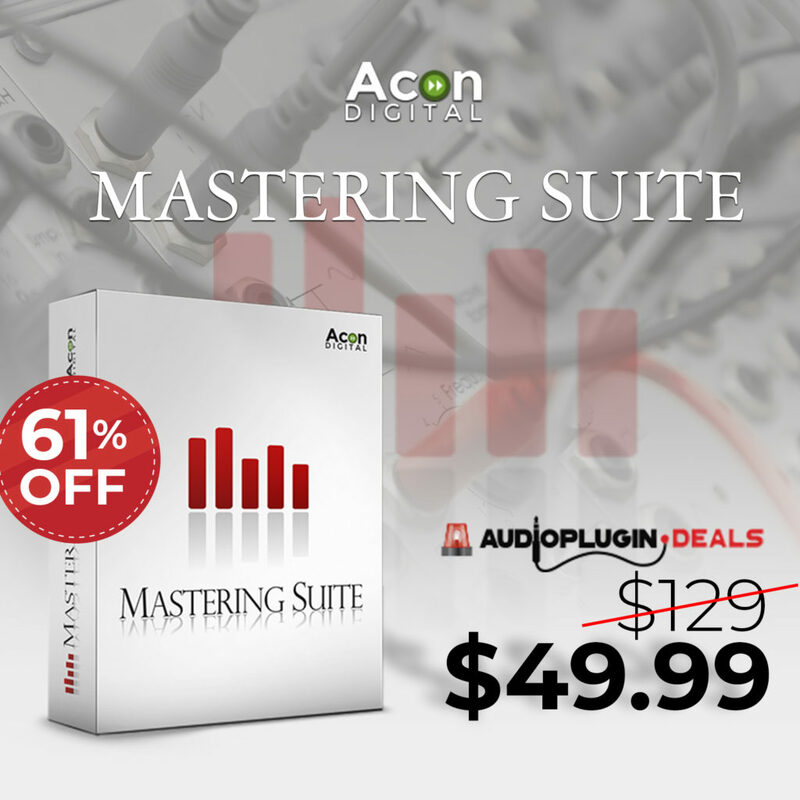 Get greater detail, explore waveforms, and control multiple parameters at once. 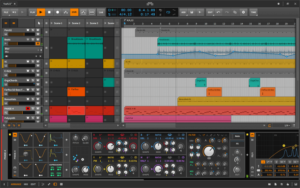 Bitwig Studio has received a generous boost in the time-stretching department by licensing the highly acclaimed Elastique algorithms from zplane. And we have also enhanced Bitwig’s own Stretch and Stretch HD algorithms, as well as adding two new ones: Slice, which slices audio at onsets, and Cyclic, a touch of retro-stretching inspired by early hardware samplers. With Bitwig Studio 2.3, you’ll always find the right stretch mode and settings for your audio material, whether you are looking for a natural sound or aiming to make an artistic point. The Instrument Selector and Effect Selector are exclusive layer devices. Only one layer can be played at a time, and the other layers are inactive to both your ears and your processor’s load. These devices are excellent for live use, particularly for swapping between patches and sounds — and not overloading your system in the act. They can also be used as multi-effects, permitting modulation and automated switching between layers. 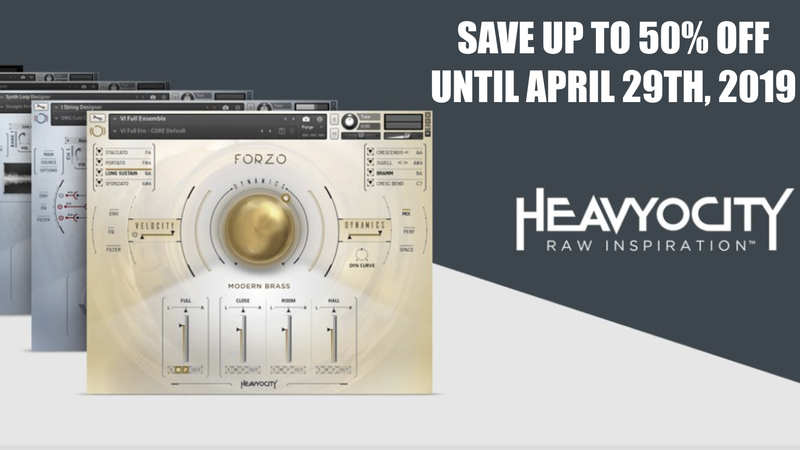 Here’s the good part: you will freely switch between layers without hard breaks or clicks, and your sustained notes and reverb tails will fade away naturally. Furthermore, the Remote Controls follow your selection in a dynamic and predictable way. We’re introducing voice stacking for a selection of our internal instruments, opening up incredible sound design possibilities. With voice stacking, you can create thick, lush sounds that were previously out of reach. We are further expanding our sound content library with a selection of new factory presets. 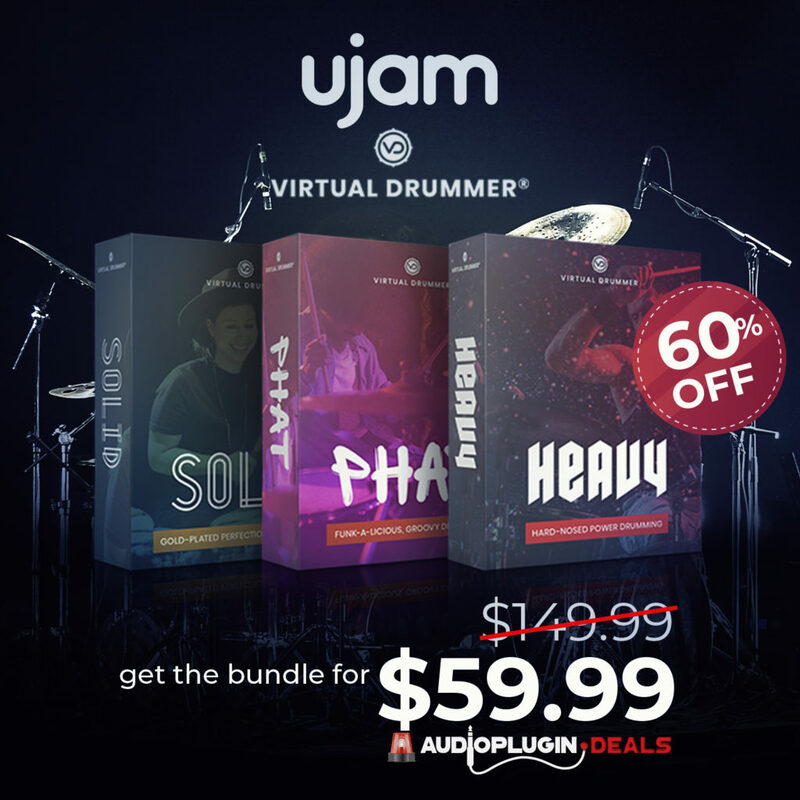 This preset collection does not only cover our new synthesizer, Phase-4, and voice stacks but also includes new sounds and presets for our existing instruments and effects. 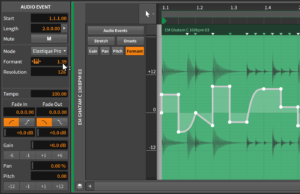 Beta testing of Bitwig Studio 2.3 is starting soon. All current owners of Bitwig Studio 2 will have access to the Bitwig Studio 2.3 Beta in their user account. The official release of Bitwig Studio 2.3 is scheduled for the end of February, 2018. NAMM 2018: Pittsburgh Modular Teases New Mono Synthesizer! First Pictures Of The ELTA Music POLIVOKS mini Analog Synthesizer Released! 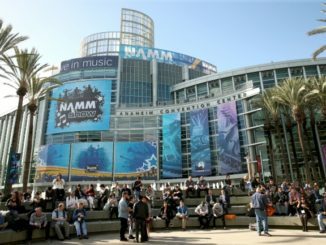 Facebook, Blogs, YouTube, SuperBooth – Is NAMM Still A Must For Electronic Instrument Manufacturers? App rental after 1st year, I’ll pass.